BUCYRUS — The annual Bucyrus Secondary School Science Fair has become a showcase of student work ethic and perseverance. This year’s Science Fair featured 87 student projects that were evaluated by more than 60 judges from the Bucyrus and Crawford County community. When the final project was judged, eight students from the Secondary School received “Superior” ratings from the judges. These students earned the opportunity to compete against other students during the 2017 Marion Regional Science Fair March 18. 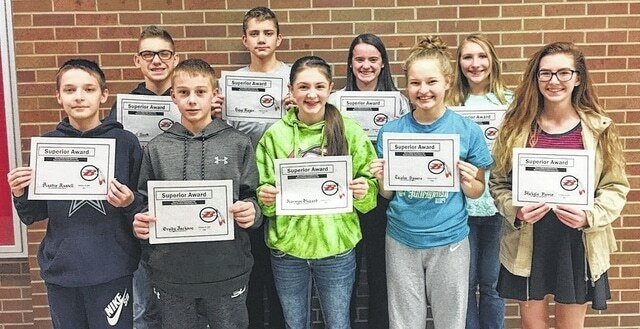 Students who received a “Superior” rating during the Secondary School Science Fair included: 7th Grade – Grady Jackson, Natalie Stover, and Karmyn Blizzard; 8th Grade – Makyla Ferris, Taisha Spears, Caleigh Rister, Samuel Rager, and Kael Scott. Along with selecting the top projects that will represent the district at the next level, judges also selected special sponsor awards. These winners included: Best Overall Project – Makyla Ferris; Best High School Project – Aubrey Cooper and Taylor Carr; Best Middle School Project – Natalie Stover; Best Medical Science Project – Caleigh Rister; Best Physical Science Project – Samuel Rager; Best Life Project – Taisha Spears, Best Earth and Space Project – Grady Jackson; Best Sports Science Project – Kael Scott; Best Consumer Science Project – Karmyn Blizzard. The 2017 Marion Area District Science Fair will be held at Alber Student Center on the campus of The Ohio State University-Marion. Students who receive a “Superior” rating at the District Science Fair will receive an invitation to the State Science Fair at The Ohio State University in Columbus. For more information regarding the science fair, please contact Mr. Patrick O’Connell at poconnell@bucyrusschools.org.